DC has announced their 2019 slate of animated DC Universe Movies, with an adaptation of the fan favorite 2002 comic run Batman: Hush leading the pack. Also announced were Reign of the Supermen, a direct followup to this week’s release The Death of Superman, as well as Justice League vs. The Fatal Five and a bonus fourth film (there are usually only three per year) in Wonder Woman: Bloodlines, which will ride the coattails of Wonder Woman 1984‘s theatrical release. Click here to purchase a Digital HD copy of The Death of Superman! Originally a 12-part Batman storyline in the pages of “Batman” #608–619, “Hush” was written by Jeph Loeb (Smallville, Heroes) with art by current DC Chief Creative Officer and co-publisher Jim Lee (“X-Men,” “WildC.A.T.s”). 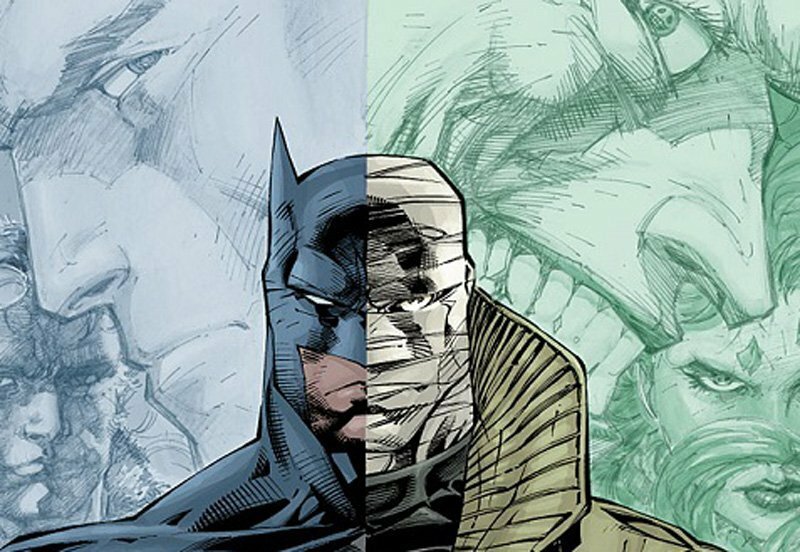 It centers on a mysterious bandaged figure named Hush who is hellbent on sabotaging Batman, and involves nearly all the major Rogues Gallery and Batman Family. It also explored Batman’s romantic relationship with Catwoman and paved the way for the return of Jason Todd. Hush will actually be the third movie of 2019, set for release by Warner Bros. Home Entertainment in the summer. The second part of the story kicked off with the battle between Superman and Doomsday in The Death of Superman, Reign of the Supermen will be the first animated release of 2019. It follows the aftermath of Superman’s death, and will introduce Steel, Cyborg Superman and Conner Kent. Fans will find Reign of the Supermen teasers in the closing credits of The Death of Superman. The Justice League returns in spring of 2019 with Justice League vs. The Fatal Five, an original story featuring the group of supercriminals (Tharok, Emerald Empress, Validus, Mano and the Persuader) originally introduced in 1967 and mostly associated with the Legion of Super-Heroes. The Fatal Five originally made an appearance in both the Justice League Unlimited and the Legion of Superheroes animated series. Wonder Woman will take center stage in an original animated movie called Wonder Woman: Bloodlines for the final film of 2019. Nothing much is known about the project, but it will follow Wonder Woman 1984 which opens on November 1, 2019. Which of the 2019 DC Universe Movies are you looking forward to the most? Let us know in the comments below!